I’m Robin Van den Hende and I live in London, England. I’ve been rock climbing for over twenty years and mountain walking and scrambling for a while longer than that. This blog is to share what I have learned about climbing and for me to learn more from the people who make comments in reply to my posts. Me on the Via Ferrata degli Alpini, Passo Falzarego, Italy. This blog aims to provide useful information and comment on rock climbing, via ferrata and other mountaineering activities. It also aims do this in such a way that it helps people have fun when they climb and to climb safely. Severe is the hardest UK trad grade that I can currently lead. I might well get better, and I hope I do, but I just want to have fun climbing and am happy if I have fun climbing routes at this level. This blog is about climbing at the grades Severe and below and having fun doing it. I don’t believe that just because a rock climb is lower in the grading system that it is of less quality. What decides whether a climb is good is what the rock climber gets out of that route, particularly whether they have fun climbing it. The lower grade routes can be great fun as well as interesting and challenging. People start their climbing experiences on these routes. Even if they move on to harder things, but can still have a good day of climbing when they return to them. Equally, there are rock climbers who are just happy doing routes on the lower grades. Me working out my next route on Little Tryfan. England’s grading system (adjectives) is much more fun than the rest of the world’s (numbers). Absolutely. There is something very English about a system in which proper rock climbing starts at a grade called Very Difficult and where multiple variations of adjectives differentiate the difficulty of climbs (e.g. Hard Very Severe). It has a nice eccentricity to it. In some ways it’s a shame that numbers were introduced with the grade Extreme, as I would have liked to see such grades as Moderate Extreme, Very Extreme and Hard Very Extreme. Just came across your Blog Robin and I like what I see. As part of a Mountain Rescue Team, I spend a lot of time on crags but at this time feel uncomfortable at HVS and above. Im interested in Via Ferrata and have completed a few on the Costa Blanca so found your post on the Gran Canaria Routes particularly good. Just hope they not above my skill level as I intend going there early next year. Thanks. I’m pleased you like the blog and the Gran Canaria via ferrata post. If you can climb comfortably up to VS, then I think you should be absolutely fine with the level of climbing on Via Ferrata La Guagua and Via Ferrata Baviera. The main issue with Via Ferrata La Guagua is it’s length – it’s about endurance and having enough water if the weather’s hot. It’s an amazing route though. Via Ferrata Extraplomix might be another story. I’ve not climbed it (I don’t think I could), but I’ve seen the videos online and it looks insanely hard for a via ferrata. Many years ago I proposed an adjunct to the grading system in Climber and Rambler suggesting an R-for-risk grade, basically to make the point that climbing a 6a up a well-protected crack on a small outcrop next to a car-park did not present much of a challenge as compared with climbing a thousand foot Severe on some vast and remote mountainside in Wester Ross [or anywhere similarly remote from a public road or air-ambulance]. They published the letter without comment, but predictably it did not become standard practice. Iain Peters did something similar in his South West Peninsula guide 20 years ago, but it would be a must for any new compilations of classic routes – anything on Lliwedd would merit a respectable R-grade, for instance. But failing that, a root-and-branch re-grading using the adjectival system plus a footnote to provide a technical grade for the hardest move should serve, along with info to do with location, length and reliability and user-friendliness of rock-type, to give climbers a more accurate idea of what they might be taking on. I am still a great fan of adjectival grades, and nobody has yet managed to kill them off, which must tell us something about their enduring appeal. Hey just stumbled upon your site and I really like it! Always up for meeting passionate climbers! Hope to hear more! Robin, great site. Only just discovered you when you in turn discovered my own “Blog on a Landscape” thing. Thanks Tom. I’m pleased that you like the site. The photographs on your website are amazing. They really show the Dolomites in all their glory and make me itch to get back there. Great blog Robin, and thanks for visiting and ‘Liking’ my blog. Your post on Via Ferrata is absolutely spot on, with advice that appears obvious yet is ignored by so many. I also appreciate your enjoyment of V/diff-severe climbs – there are many gems at these grades that are ignored by the ‘hot-shots’ out to impress. I’m really pleased that you like the blog. Part of the reason I’ve been writing it is lot of the climbing magazines seem to concentrate on higher grade climbing and this misses a lot of the fun climbs out there. I enjoyed reading the post on your blog about training a dog for avalanche rescue – really interesting and informative. I’ll keep an eye out for your next post. A part of the reason that I started writing the blog is because it felt like there wasn’t that much written specifically for climbers like me. Climbing magazines, for example, can sometimes feel like they mostly write about Premier League climbers and for climbers playing in the 2nd Division. This can be really interesting, but I’m the equivalent of the guy who likes kicking a ball around the park on a Sunday with his mates. It’s great that people want to do hard things and can do them. I want to have fun climbing at grades they I’m comfortable with or that challenge me just enough to push my skills, but not so much that they terrify me. I’d love to be able to climb really hard grades, but, like a lot of people, my life doesn’t necessarily allow the training and time spent climbing that is required. I’m a weekend climber. I live in London, not near crags, and don’t own a car. I get to the climbing wall as regularly as I can and go out on rock as often as I can. I think there are quite a few people in similar situations. It would be nice if more was written for us and for anyone who just enjoys a good V. Diff or Severe. Absolutely. The hard stuff is for people who have time and inclination to train incessantly. I think ‘natural’ climbing ability varies between VDiff and Hard VS depending on age, agility, strength, experience, and inclination. I was always well-content with mountaineering VDiff/Severe, and VS to HVS max on outcrops. Plenty of classic routes to go at at these standards. People who climb so well that they can no longer enjoy ‘normal’ grades may actually be worse off than the bumblies. Havn’t climbed for years because of a lower back injury, but I live in hope of recovering enough to stagger up to the Teyrn Bluffs or Craig Lloer or somewhere like that. Keep writing! There is lots to really enjoy in climbing at those grades and they can be classics for very good reasons. Sometimes it feels like they don’t get the recognition they deserve (although the polish on some routes shows they definitely get the traffic). I’m sorry to hear about your back – that’s really tough. I hope your back gets better enough to enable you to go climbing again. PS – pondering your comment about ‘classics for good reasons’ there ought to be a thorough reassessment of climbs made out of their time, not considered ‘classic’ more because the grade was no longer anything like ‘cutting edge’ at the time they were made. One I never got round to was Engineer’s Climb on Craig Fawr [Cwm Silyn] and another was Wolf Buttress on Castell Cidwm. Never got up to Diffwys on Moel Hebog either. Always regretted those three. Thanks. I think there’s something in that and it would make a good project. I’d be interested in writing something about the unrecognised or forgotten climbs that should be called classics. Now I just have to find the time to research it and write it. In northern Snowdonia alone, apart from those mentioned before – Craig Cwm Du, totally forgotten things like Lichen Ridge; Mallory’s Ridge [Nantlle]; Llechog; the far west buttress of Cloggy; Y Diffwys; Carnedd Y Filiast and Creigiau Gleision [the big crag on Foel Goch, not the one in the Carneddau] ; that big crag to the east of Tryfan the name of which escapes me. There’s a big route in the Moelwyns too that I ought to remember. Moel Siabod has some good cliffs in a fabulous position. The ridge route on Rhinog Fach [FA Showell Styles and friend, 1935] has been ‘rediscovered’ recently and is apparently an excellent Severe. Trwyn Y Gorlech, Avernus. Lots of forgotten gems. You’re making me realise that there are a more than a few climbs out there that I’m missing out on. Thinking about it is also making me want to get out on the rock again soon. I’m going to be sure to look up those routes. Nothing like having a collection of 50 year old CC guidebooks with full route details of all the old stuff! EG Perrin’s ‘Cwm Silin and Cwellyn’. ‘Avernus’ on Trwyn Y Gorlech in particular is supposed to be an epic Lliwedd-scale Severe, a bit like a double-height version of the Main Wall on Cyrn Las with a grandstand view of the Irish Sea. Trevor Jones must have exulted when he found that one…. I could never find a partner who fancied giving it a go. Thanks John – you’ve given me a lot to think about. I like the idea of finding and trying old classics that have been unjustly forgotten. However, with a new baby arriving any day now, this looks like a project for next year. Still, in the meantime I might have to have a look around some second hand bookshops (maybe the net too?) for those older guidebooks and then do some reading. I didn’t start climbing until my 50s so I don’t suppose I’ll ever be a superb climber now. I tend to prefer the single pitch stuff too which is probably a bit limiting, but maybe that’s because I’m still a beginner. I’m finding it very hard to get outdoor climbing partners, despite regular attendance at the local indoor wall. It’s also gritstone around here which I can’t seem to manage – grippy but just too rounded for my current style. I was looking at Tryfan Bach last time I was in Snowdonia (I’m in a climbing club with a cottage there) and it looks like a great place to progress my outdoor climbing. 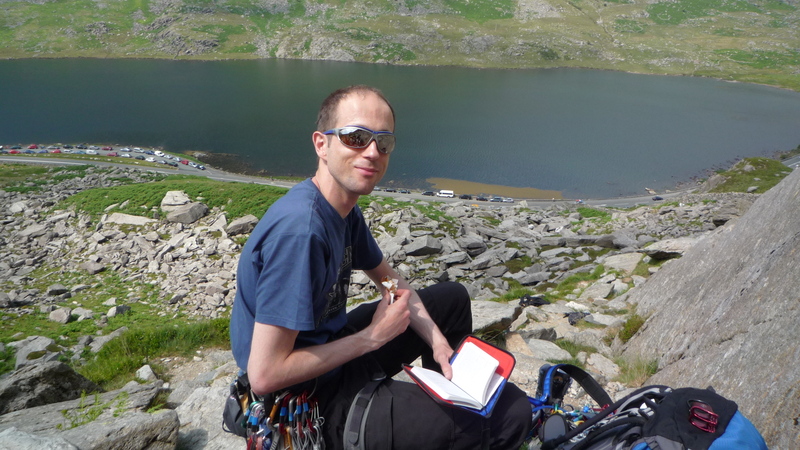 Hopefully someone in the club will partner me… Have you done Atlantic Slab in the Ogwen Valley at all? That has fascinated me for years! I think easier graded climbs can be great. Easy is relative – what’s important is a person’s experience of the climb. It’s also possible to judge a climber as superb on more than whether they can climb a hard grade. For example, I’ve seen people at crags who can climb an HVS but mess up basic safety. My wife’s not a fan of grit either. We both really like Tryfan Bach though and it’s a good place for a beginner or for a relaxing afternoon. It’s also not like grit, with the routes often at an easier angle and quite a few cracks with good hand holds. Tryfan Bach is popular though and this does mean the rock is a bit polished in places, but not so much as to be worrying. I don’t think I’ve ever done Atlantic Slab. Thanks for the recommendation – I’ll have a look the next time I’m around there. Don’t know if a reply I drafted earlier got posted, but if Grit=Peaks rather than Yorks then I suggested checking out Harborough Rocks if you’ve not done so already – it’s on the southern scarp of the Peak District not far from Matlock, offers some really nice easy grade climbs on Brassington Limestone, which is very unusual stuff reminiscent more of Quartzite or MicroGranite. If you’re allergic to grit Charnwood Forest in Leicestershire and Pontesford in Shropshire are also good. Don’t take sticky rock-slippers to Charnwood though, because they won’t stick – the rock [Diorite]has the frictional properties of glass or marble! Nope, I didn’t get that reply earlier. I’m actually in Yorkshire but keep meaning to check out some of the easier gritstone crags in the Peak. Still busy trying to ‘compleat’ the Munros this year though so it would definitely have to be another year. Hello Carol – if in Yorkshire then Shropshire and Leicestershire are less use to you and the ‘trad’ outcrops for lower-graders in the Peak are obvious of course – Birchen and Burbage and Laddow are the ones I remember as being best for bumblies like us. I knew a climber from Northumberland who swore by the whin sill crags at places like Crag Lough, but that is obviously no nearer to Yorkshire than the Lakes! Hope you find your own creative solutions to ‘gritstone aversion’. If you’re passing Junction 22 on the M1 and can’t resist the idea of some cragging, Leicestershire’s Markfield quarry is but two minutes away as the centrepiece of a nature-reserve…. Not worth a visit from afar but glacial Leicestershire diorites are definitely an experience. The other places are well worth visiting if you’re in the vicinity, especially Pontesford, which offers some fine lower-grade climbs in a beautiful setting including one biggish VDiff, Varsity Buttress [about 200ft]. As a change from the toiling queues of Gable, Bowfell etc, have you considered Dumfries and Galloway? I have a great website by a local climber which should still be in my bookmarks. There are several largish crags which should suit a keen walker – you would not have to queue for routes on Craignaw, for instance! Once you’ve ticked all your Munros you will of course go for the Corbetts – including some rocky ones like the Garbh Bheinn of Ardgour, Suilven and all the rest….good climbing. Actually, I don’t think I am going for the Corbetts – only the ones I fancy. I’ll probably to a Munro ‘tops’ compleation next if anything as I only have 45 I missed out. Some of them are pretty much low-grade climbing, e.g. Knight’s Peak, Basteir Tooth & Corrag Buidhe on an Teallach. Well, there’s always a bit of limestone around, but then there’s limestone and limestone, hence my mention of the delightful [Dolomitic] Harborough Rocks, usually dismissed as a ‘school party crag’. I’m sure you can think of equivalents elsewhere. ….I’d be intrigued to know of your recommendations in the Yorkshire Dales. Cherry-picking your Corbetts sounds like an excellent idea! Reading up on Leicestershire though, I have encountered in extreme form something of concern in many places: the re-opening or in-filling of quarried rock at the behest of voracious business-interests, loss of amenity, loss of access even in places where one presumed that was guaranteed in perpetuity. I mentioned Bardon, one of the best volcanic crags in lowland England, some great routes with astounding panoramic views, and at present totally inaccessible……..just one among several major examples. I think they will always re-open quarries for quarrying where possible rather than trying to get permission to start a new one in virgin greenbelt land – something they’ll struggle to get permission on. The in-filling sounds like a really bad idea though. I’ve got lots of small 20 foot or so single-pitch limestone crags I’ve looked at which I fancy climbing but it’s not to say they’re listed anywhere – they might not have sufficient protection available or suchlike. One such set of crags is on Warrendale Knotts above Settle – the hill has 3 bands of crag running round it and the bottom two tiers look very good to me.. I note there are loads of climbs listed on Attermire Scar opposite but can’t find anything listed for Warrendale. But I’ve seen plenty of tempting looking routes up – just haven’t had a climber to suss them out as I don’t know any proficient outdoor climbers round here. PS – having googled some images of Warrendale Knotts I see your point, though those steep tiers with horizontal breaks look to me like mostly ‘VS and above’ territory. There must be some flanking ridges to the steep sections where an airy VDiff or two might be found. Looks like a good prospect if there are no access problems. Re the filling in of quarries, Leicestershire Council actually bought a quarry, Morley Quarry, with the idea of equipping it for climbing – except that it’s totally unsuitable for climbing, whereas Whitwick Quarry, which had some of the best routes in the county, is now land-filled! No prizes for guessing who the County Council did NOT talk to before making such planning-decisions. Good climbing and walking, hope you can enthuse a reliable partner. PPS – I’ve now found and read your blog about Warrendale – good work, surely you can get someone interested by showing that to them? The buttress to the right of your ‘minor epic’ gully looks like it would yield a somewhat longer route at an amenable grade? Sorry about the PSs – should have spotted your piece before writing the earlier comment. Memo to Carol: if you’re in the Peak District you might like to find a partner and go up to Harborough rocks, on the Southern Scarp of the Peak, which is Brassington Limestone and offers short routes in easier grades on rock which mimics the characteristics of volcanic crags. The limestone of Brassington and Rainster [a bit steeper] is attractive and unique, it’s even quite unaffected by rain. Birchen Edge [if you’ve not tried it?] is also not like most grit outcrops – routes are at more amenable angles. The rocks of Charnwood Forest in Leicestershire are likewise volcanic not grit, not far south – you get a representative sample of outcrops at places like Beacon Hill, but don’t expect the rock to have ANY frictional qualities, incut holds and edging are the order of the day.If you get more ambitious try Pontesford in Shropshire. There isabsolutely nothing wrong with sticking to Diffs if that’s what you enjoy, and you’ll still find plenty of people in some places [eg Ogwen Valley] who’d heartily agree. The ‘harder is better’ doctrine is propaganda, designed to make us hero-worship the hard nuts, it always was: but this makes no sense in what is supposed to be a participant-sport and an enjoyable leisure-activity…..
Hope all goes well for the new arrival! Crossing fingers [and karabiners?] for you. Having dug them all out I now have a sofa-full of Climber’s Club guides from the period in question. They are full of esoteric gems even for popular places like Tryfan East Face and Craig Yr Ysfa which I bet no longer get much if any mention in the highly-filleted modern guidebooks [stopped buying them or looking 20 years ago]. Consulting them I find ,for instance, that ‘the crag East of Tryfan’ whose name escaped me was of course Gallt Yr Ogof, and this only gets a mention nowadays if at all for Chalkren Stairs, because Ron James featured the route and we all put it on the tick-list, but Netts, Capstone Climb, Bee’s Buttress, Gnat’s Gnose and Steep Wall all look worth doing if you’re a connoisseur of Diff-to-Severes. And were there not some good additions to the back of the Milestone? And on Creigiau’r Dena? Eric Byne and his friends found some good ones in the 1930s-50s. Easter Ridge was one example; [Creigiau’r Dena 300ft VDiff]. Pierrot on Milestone West was another [270ft VDiff]. I can relay detailed descriptions if you can’t find them elsewhere – also for Creigiau Gleision, where Tower Ridge I’d say looks the best of the bunch [400ft VDiff]. The Moelwyn route I was struggling to recall was Kirkus’s Climb on Clogwyn Yr Oen, but Taith y Perein on Craig yr Wrysgan [430ft Hard Diff] looks fun. So does the Nameless Rib [what an inspiring name] on Craig Yr Ysfa, [430ft Hard Diff] which I’d quite forgotten about until I spotted it in Moulam’s Carneddau guide this morning. Hope Carol finds some use for my relayed information. In Leicestershire you used to get fabulous exposure at Bardon Hill, where the 100-120ft climbing-crag was a top tier above 2-300ft of quarried faces far below. I understand there are access-problems these days, so I’m glad that I climbed there when I did. ‘Black Cleft’ was a very good mild Severe. Thanks John. That’s really useful info and it’s very good of you to look these routes up. There’s a lot for me to think about and research and I’m intrigued by the whole project. I might end up being a bit slow though, as I suspect it will be mountains of nappies and trying to catch-up on sleep that will keep me occupied in the immediate future. I’m determined to fit it in some how though. PS re Carol’s gritstone-aversion and Leicestershire, having checked the current state of access I note that the best crags there for lower-grade climbers are Markfield Quarry, Craig Buddon, and Beacon Hill. Bardon is verboten at present, as in Huncote; access elsewhere is restricted in several cases for a variety of reasons. This is info well worth sharing as thirty years ago a sort of artificial wedge was driven between ‘hard scrambling’ and ‘proper climbing’ [defining VS as the new Diff grade, so to speak] and a lot of information fell down the hole inbetween. I have some entries in my ancient Snowdon South guide for the Nant Gwynant area which even I had never clocked before, for instance. Please feel free to ask me about anything I might be able to look up for you if you can’t find info or old guides. Good luck with the mountains of nappies – a phase of my own parental life which I remember without nostalgia….. Thanks for your appreciation. Look forward to reading more. Glad to know another London climber and looking forward to reading more on your blog. Great and useful blog! Thank you so much! Guys, any place, organizatio, company, guide near north of Milano that offer some introduction training to the Via Ferrata? I don’t know anyone I’m afraid. Sorry. Try contacting Colletts at https://www.colletts.co.uk/walking-holiday-specialist/. They are Dolomites based and used to offer their own via ferrata holidays and days out. Seems they don’t offer VF any more, but they are bound to know the local companies etc who do. Colletts have a good reputation going back many years, and won’t mess you about, I’m sure. I mentioned a month or so ago that I was heading of to Engelberg to do a three day VF course, or Klettersteig as the German speakers call it. It went quite well although the harder longer route was a non starter due to bad weather. Maybe just as well, although it is a good excuse to go back next year to complete it. Now I will do rock climbing or indoor wall to keep my hand in, so to speak, and look to invest in helmet and VF set, to bring . I’m glad that the course went well. Sorry that you didn’t get to do the harder route – that’s frustrating. I’d take any excuse to do some via ferrata and I hope you do get the harder route done next year.